A fertilized human egg may seem like the ultimate blank slate. But within days of fertilization, the growing mass of cells activates not only human genes but also viral DNA lingering in the human genome from ancient infections. Now researchers at the Stanford University School of Medicine have found that the early human cells produce viral proteins, and even become crowded with what appear to be assembled viral particles. These viral proteins could manipulate some of the earliest steps in human development, affecting gene expression and even possibly protecting the cells from further viral infection. The finding raises questions as to who, or what, is really pulling the strings during human embryogenesis. "It's both fascinating and a little creepy," said Joanna Wysocka, PhD, associate professor of developmental biology and of chemical and systems biology. "We've discovered that a specific class of viruses that invaded the human genome during recent evolution becomes reactivated in the early development of the human embryo, leading to the presence of viral-like particles and proteins in the human cells." A paper describing the findings was published online April 20 in Nature. Wysocka is the senior author, and graduate student Edward Grow is the lead author. Retroviruses are a class of virus that insert their DNA into the genome of the host cell for later reactivation. In this stealth mode, the virus bides its time, taking advantage of cellular DNA replication to spread to each of an infected cell's progeny every time the cell divides. HIV is one well-known example of a retrovirus that infects humans. When a retrovirus infects a germ cell, which makes sperm and eggs, or infects a very early-stage embryo before the germ cells have arisen, the viral DNA is passed along to future generations. Over evolutionary time, however, these viral genomes often become mutated and inactivated. About 8 percent of the human genome is made up of viral sequences left behind during past infections. One retrovirus, HERVK, however, infected humans repeatedly until relatively recently—within about 200,000 years. Much of HERVK's genome is still snuggled, intact, in each of our cells. Most of these sequences are inactive in mature cells, but recent research has shown that they can spring to life in tumor cells or in human embryonic stem cells. A study published in February in Cell Stem Cell by researchers from Singapore's Genome Institute showed that sequences from a primate virus called HERVH are also activated in early human development. Now the Stanford researchers have shown for the first time that viral proteins are abundantly present in the developing human embryo and assemble into what appear to be viral particles in electron microscopy images. By following up with additional studies in human embryonic cells grown in vitro, scientists showed that these viral proteins affect gene expression in the developing embryo and may protect the cells from infection by other viruses. But it's not clear whether this sequence of events is the result of thousands of years of co-existence, a kind of evolutionary symbiosis, or if it represents an ongoing battle between humans and viruses. "Does the virus selfishly benefit by switching itself on in these early embryonic cells?" said Grow. "Or is the embryo instead commandeering the viral proteins to protect itself? Can they both benefit? That's possible, but we don't really know." Much remains to be known, but it's clear the fates of both are intertwined within days of conception. "Our early human development is unique and depends on genes and DNA sequences we picked up recently in our evolutionary history," said study co-author Renee Reijo Pera, PhD, who is a former professor of obstetrics and gynecology at Stanford. She is now on the faculty of Montana State University. "What we're learning now is that our 'junk DNA,' including some viral genes, is recycled for development in the first few days and weeks of life." Grow and his colleagues found that some HERVK viruses are transcribed into RNA—the first step in making proteins based on the blueprint provided by DNA— in 3- to 4-day-old embryos. This viral activation coincides with the activation of other key human genes in the embryo. The researchers then used electron microscopy to observe what appear to be intact viral particles in human blastocysts, which arise within five to six days after fertilization. HERVK also encodes a viral protein called Rec, which binds to viral RNA transcripts made from DNA sequences, and escorts the transcripts to the ribosomes in the cells' cytoplasm to be made into proteins. Researchers found that Rec not only affected the expression of viral genes, but it also binds to many RNAs made from human genes. Rec also modulates the RNAs' interactions with the ribosomes. Finally, the presence of Rec in human cells stimulated an immune response that increased the amount of a surface-bound human protein called IFITM1, which protects the cells from viral infection. "There is a long-standing debate within the field of genome evolution," Grow said. "Why retain so much seemingly useless and repetitive DNA within our genomes? Our results demonstrate a tangible and physiologically relevant phenotype—improved antiviral immunity. This clearly implicates HERVK expression in the embryo as a potentially beneficial strategy." Although there's no direct evidence yet that HERVK reactivation provides a selective advantage for human development, the study's results are intriguing, said Wysocka. 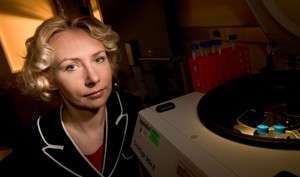 "The mere observation that viral proteins are expressed and able to engage cellular machinery in complex ways shows that in order to fully comprehend intricacies of early human development, we need to consider the function of these genome invaders," she said. JVK trying to sell his perfume. Actually behind introduced for the convenience of conscience of doctors practicing abortion concept embryo stands word man. Man began his life at the moment of the merger of male and female germ cells and abortion literally meaning murder. See this review of virus-induced biodiversity from 2000 in "Nature." Abstract excerpt: "Human-specific integrations for some very young LTRs were demonstrated. The possibility of LTRs and HERVs involvement in the evolution of primates is discussed." Vietviet, yes, and it smells badly. Nowadays he has to resort to unsubstantiated personal attacks. Apparently when you know, or have practiced, science, you are a "science idiot" just for pointing out his inadequacy in understanding basic, simple science like evolution and his insistence in pushing non-contextual references (or his own crackpot ones) into comment threads. I'm pointing out that the simple-minded belief in neo-Darwinian evolution is based on pseudoscientific nonsense. For comparison, I have detailed biologically-based links between the epigenetic landscape and the physical landscape of DNA in organized genomes that are driven by differences in viral microRNAs and nutrient-dependent microRNAs via RNA-mediated amino acid substitutions and cell type differentiation in all genera. The fact that Greg Bear predicted the findings here attests to the ignorance of theorists who have never linked nutritional epigenetics to metabolic networks and genetic networks via virus-driven entropic elasticity and the anti-entropic epigenetic effects of nutrient-dependent microRNAs that link the physiology of reproduction to fixation of the amino acid substitutions that stabilize organized genomes.